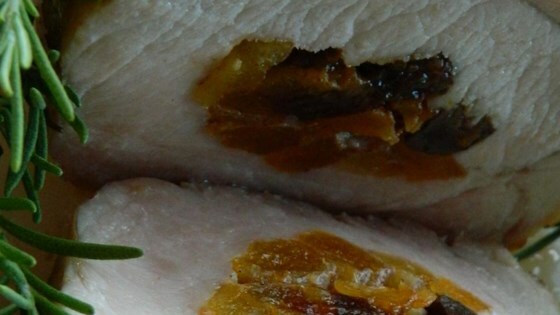 "Pork is an excellent choice for a holiday family dinner. Stuffed with orange- and ginger-accented dried fruit, the glazed roast slices beautifully and appeals to all ages." Mix prunes, apricots, ginger, orange zest, 1/2 teaspoon cumin, and cinnamon in a bowl; season with salt and black pepper. Open pork roast and spoon stuffing down the center; fold meat over stuffing and tie securely in several places with kitchen twine. Set roast onto a rack in a roasting pan. Combine brown sugar, flour, cider vinegar, 1 teaspoon cumin, and mustard powder into a paste; spread brown sugar mixture over the roast. Bake in the preheated oven until a meat thermometer inserted into center of stuffing reads 160 degrees F (70 degrees C), about 1 1/2 hours. Transfer roast to a serving platter and tent with aluminum foil while you make gravy. Skim fat from roasting pan and transfer defatted drippings into a small saucepan. Pour 1/2 cup water into roasting pan and scrape up and dissolve any browned bits of food into water; pour into saucepan with pan juices. Bring pan juices to a boil over medium heat. Dissolve cornstarch in 1 tablespoon water in a small bowl and whisk cornstarch mixture into pan juices, stirring constantly until thickened, about 1 minute. Strain gravy into a gravy boat. Serve gravy with roast. I made this for Christmas Eve dinner. It was great!! The only thing is I didn't make any gravy be cause I didn't have enough fat drippings, but I think it was better without the gravy. I did alter the recipe. I only had fresh figs and apples. So, that is what I used. I omitted the cumin. It was excellent! I've been making this dish, (or some variation) for 30 years. It's a wonderful main dish for any occasion. I'm making it for Christmas this year.